You might know winter weather can cause serious heart problems. However, the winter season has left, and the summer came into the act! And now, what about the summer? It’s not that easy for our hearts to handle the heat always. Hot, humid days can put your heart at risk, too, especially people with pre-existing heart issues are under tremendous risk of heart attacks and strokes. So, particularly they need to be very cautious with rising temperatures. The heart will work little harder to cool off itself in hot weather. Even a healthy heart can be under severe stress if we don’t take ample care to protect it. Luckily, a few basic healthy living tips are quite enough that help us to enjoy the summer in a heart-healthy manner. Summer heat takes out excess fluids from the body, often known as dehydration which can lead to heat exhaustion and heat stroke. When your body doesn’t have sufficient fluids, the blood volume will get dropped, that means will be no proper supply of blood to the heart and can’t pump to various body organs. In some cases, organs will not have adequate blood to function properly. It is essential to stay hydrated, drink more fluids such as water, coconut water, soups and juices. Some people above the age of 50 years even fail to recognise that they are thirsty and more likely to be dehydrated and get heat stroke. Take plenty of water before, during and after any physical activity, or when you’re out in the humid sun, to avoid dehydration. Ensure to drink water at frequent intervals, even though you are not thirsty. People who take medications for high BP or heart disease need to be more cautious in the heat as those drugs may cause abnormal reactions in the body. Some medicines can cause skin problems under sunlight. Some other medications such as diuretics, or water pills, that help to flush out the urine can also promote dehydration. Other classes of drugs like antihistamines and antidepressants also affect the regulatory body system. Don’t stop your medication, it’s a wise idea to check with your doctor for proper dosage of medication to take in during summer. Dress Up For The Heat! If you need to spend more time outdoors, make sure your outfit is appropriate, it should be light-weight, light-coloured clothing and breathable fabrics such as cotton or a synthetic fabric which repels sweat and help your body stay as cool as possible. Also maintain sunglasses, a hat and well-ventilated shoes and socks which will also help you to manage your body temperature in the heat. Probably you need to avoid dark clothes and heavy fabric as they likely to raise your body temperature. Most of the people prefer to exercise outdoors, exercising in summers drains out your energy faster which can cause unusual stress on the heart. Limit your outdoor exercising time, prefer indoor exercise and drink more water during exercise. You need to limit your outdoor activities like brisk walking, running, bike riding or gardening. Stay under shade at peak hours (10 a.m. to 4 p.m.) of the humid sun. Take adequate rest i.e, sleep well to maintain good hygiene by maintaining the same bedtime and wake-up schedule. Keep An Eye On Your Diet! Eat more fruits and vegetables with more water content which will help to maintain your body temperature and keeps cool. Most of the fruits and vegetables contain antioxidants that help in reducing the risk of atherosclerosis, building up fat, cholesterol on inner walls of arteries. Most of the heart specialist suggest taking at least 4 to 5 cups of fruits and vegetables per day as part of a healthy lifestyle which can ultimately avoid risks for heart disease and stroke. Limit Caffeinated And Alcoholic Beverages! Consumption of alcohol or caffeinated drinks during summer may trigger dehydration which increases your risk of heart complications. 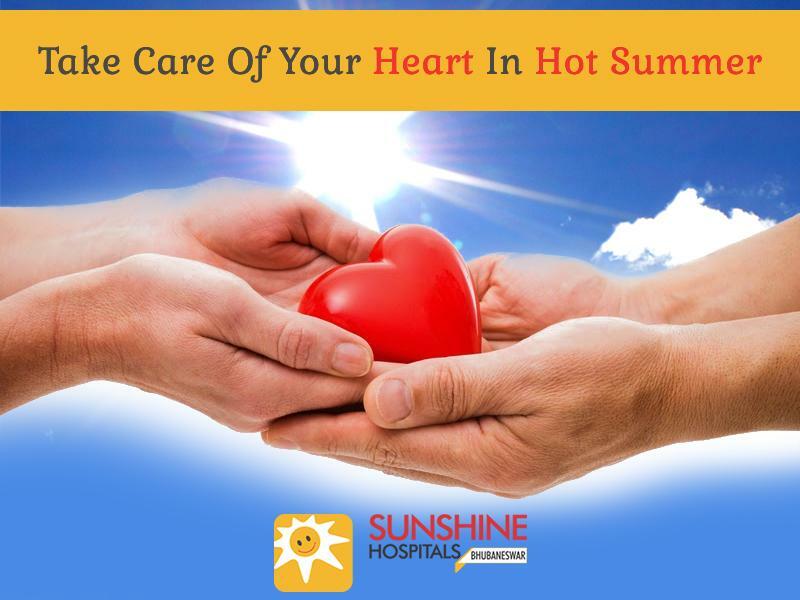 Some people may have prior heart surgeries like angioplasty or with stents and artificial heart valves need to take extra care in summer as dehydration may cause thickening of the blood and can block the stent. So it’s better to increase your intake of water to avoid dehydration. However, be in touch with your doctor regularly for better care. If you notice any unusual changes in your health like high fever, dizziness or confusion, over-sweating, red, dry or moist skin visit the nearest hospital immediately to avoid any causality.